After a stay in a hospital near my home in Berkeley, California, I received a questionnaire from the Administrator. I responded that I had been delighted with the courtesies and professionalism of the nurses, technicians and physicians, but I resented the antisemitism. On my second morning there, my breakfast tray contained a curious item: wrapped in cellophane was a round, cold, soggy bread-like substance, ashamed of its own pallor. The menu labeled it as a bagel. I told the administrator that anyone calling that deeply offensive object a bagel must be a rabid antisemite. The episode got me thinking of the bagels in my life. The early ones spoiled me rotten; they were a gastronomic high point of my 1950s youth in Cape Town, South Africa. What I remember best were the summer weekend expeditions to Muizenberg beach, and the interruption, either on the way there, the way back, or both, to buy bagels from Mrs. Marcus. Mr. and Mrs. Marcus lived in a very modest house on the east side of Buitenkant Street, just a block or so north of Mill Street, in Cape Town. I think he was a cobbler. In order to augment the family income, Mrs. Marcus began to bake bagels for sale in the community. They were so delicious that she soon had to install a second, larger commercial oven. That’s when she became famous. Her bagels were exquisite, crispy golden brown on the outside, soft and addictively chewy on the inside. I remember a time when we stopped on the way home from the beach, and my mother went into the Marcus home for six bagels. We lived only about a mile away, and by the time my parents and I got home all we had left was a crumpled brown bag and a few crumbs. That was the ultimate test: they needed no butter, or cream cheese or lox. Mrs. Marcus’s bagels were not coated with onion flakes, or sesame seeds, sun-dried tomatoes, or, heaven forfend, blueberries. Now, if challenged to choose an accompanying drink, it would have to be the finest Ceylon tea, the most expensive Kona coffee, or a bottled product representing the ultimate of the Bordeaux region. At the time, I think I liked Coca Cola. Mrs. Marcus’s trade soon brought her to the notice of the authorities, who insisted that she obtain a baker’s business license and arrange her premises in a more commercial way. That would have incurred an expense that she could barely afford, and led to a ploy the memory of which still charms me. On one occasion, when I entered her house to make a purchase, she had company. Two young gentlemen were present, distinguished from her other customers by their crew-cut hairstyles and what looked very much like police-issue boots. Before I could ask for bagels, she introduced them by name, and though here my memory fails, they were probably called something like Mr. van Zyl and Mr. van der Merwe. To the introduction she added softly, in Yiddish, “blanke kneplach” (“shiny buttons”), a metaphor for police uniforms. She then handed me a bag of bagels, kissed my cheek and hoped I’d enjoy the gift. No money had changed hands, and therefore no evidence of commercial transaction. This scene was acted out repeatedly with others over some months, and finally the authorities gave up and withdrew the bagel police for other, more questionable, law enforcement work. A day or two later after each event, her customers brought Mrs. Marcus the money. There’s much to remember about my youth in South Africa. The beauty, the warmth of family and communal life, the early education that eventually led me to universities and careers elsewhere, and the crushing injustice, the immense crime against humanity, of apartheid. 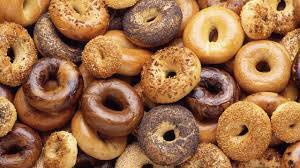 I have since eaten bagels in Berkeley, Los Angeles, New York, Vancouver, London, Paris, Krakow, Tel Aviv and even near my daughter’s home in Cuernavaca, Mexico, where the hotel menu described them as un tipo de pan Ingles, a kind of English bread! For the last twenty-five years, after careers in academia, then business, I am now, most enjoyably, an autodidact student, and occasional instructor, in art, an exhibited and published artist. I’ve come to realize that the experience that began with visits to the National Art Gallery in Cape Town, exposure to the work of artists at the Michaelis School of Fine Art, and my frequent attendance of symphony concerts, led me to consider those elements which contribute to greatness in art: composition, coloration, balance, harmony, surprise, and sensory nourishment, among others. I found these in the great paintings, sculptures, architecture, photography, literature and music that have illuminated my soul and so enriched my life. That's when I realized that Mrs. Marcus had also been an artist.